If you live in a house that has a wood-burning fireplace, then chances are that you have access to tree stumps or large blocks of wood. These are great for making stands for your Jack O'Lanterns. You could use a chisel to slightly hollow out the middle of the stump so that the lantern can sit stably or simply use some Blu-Tack or Velcro. 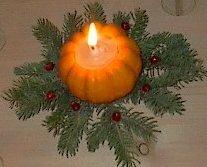 Get some small or mini pumpkins and hollow them out to use as candle holders. If open flames are out of the question, you can put glow sticks instead of candles for a different effect. You can carve, draw or paint faces on the pumpkins too. Instead of pumpkins, you could use apples as well. Ensure that you choose apples that sit well and flat or cut off the bottom to make a flat surface. Remove the stem and cut around it deep enough for the candle. It is best to use taper candles for a better fit. You can use these Halloween crafts for several weeks before and after halloween. Pumpkins are almost mandatory when it comes to Halloween crafts for your party. Get a large pumpkin and hollow it out to use as a salad bowl or to serve fresh vegetables. Cut off the top, hollow and clean it out and let it dry in the sun. You could carve a jagged edge design on the top. Do the same with some smaller or mini pumpkins to use for dips or salad dressings. Use publicly available Halloween fonts on your computer to make banners or invitations for your party. It's a fast, easy Halloween craft you can use instantly to enhance your party theme. You can even print them onto inkjet iron-on transfer paper and put them onto your favorite t-shirt or Halloween outfit. Using glue and food coloring, you can make a see through painting. Paint a Halloween image onto a piece of plastic wrap. Before the mixture dries, put another piece of plastic wrap on. Cut it out and hang it in front of a light source for a see through effect. You could also frame the plastic pictures using wood or cardboard if you want them to be longer lasting. You can make all kinds of Halloween crafts from this idea. Kids favorite Hallween crafts are making shrunken heads. Using apples, you can make dried, shrunken heads. Peel the apples and coat with a mixture of lemon juice and salt to prevent browning. Carve out a face of eyes, nose and mouth. Do not worry about the finer details as they will probably be lost when the apple dries. You can use whole cloves for the eyes and rice grains for the teeth. Let the apples sit out in a warm place for about 2 weeks. If you don't have 2 weeks, you can speed up the drying by putting them into an oven on the lowest temperature for about 45 minutes and then to dry out naturally for the next 2 days or so. Once dried, they shrink and deform into weird and scary looking faces. Here are more Halloween crafts for your next party or any other Halloween occasion you are involved with. For more fun and satisfaction, create your own Halloween crafts from some original and unique wares. Who knows, you may even be able to sell these to your local Halloween store come next October. There are many elements that go into creating a fun Halloween party. After making all of your unique crafts everyone will need Halloween costumes that fit the party motif. Everybody loves a party with funny costumes that bring a light-hearted, humorous touch to the Halloween festivities. Make sure to plan a party that creates a perfect atmosphere easily enjoyed by everyone attending your special Halloween event. Happy Halloween! Try our Arts And Crafts Secrets newsletter! It's FREE!